While being aware of potential problems will lower the chances of you having an eBay dispute, sooner or later you are going to have a problem. Maybe the seller never sent you your item? Maybe the item was not as described? This article explains how to use the eBay dispute system to get your money back when you have problems buying on eBay. If you paid with a credit card or through paypal, you can get faster results by going directly to Paypal or your bank. See below. Before I get started let me make an important point. You must be calm and polite during the dispute resolution process. I know you are upset, but being rude or loud to eBay support people or the seller will only make resolving the problem more difficult. If you are emailing the seller, have a friend read your emails first to ensure they are calm and clearly explain the problem. Your disappointment might be a simple mistake on the part of the seller. Name calling and argumentative language will put sellers who would resolve the problem otherwise on the defensive. If your emails do not resolve the problem, try to call the seller and solve the problem on the phone. If the item was different than what you thought you were buying, explain the difference. If you never got the item, confirm the seller shipped it. If talking to the seller on the phone does not resolve the problem , go to: eBay, and start a dispute. There is also a link to a report a problem on your eBay Item watch page. You have to open a dispute within 60 days of the end of the auction, and eBay will close the dispute at 90 days whether it is resolved or not. Once you file a dispute with eBay, the seller has ten days to respond. If this new dialog results in satisfaction, you can drop the dispute. If you and the seller cannot reach an agreement, or the seller does not respond, you can then file a complaint with eBay's Trust and Safety team. eBay will pay you the money you are out less a 25 dollar fee with the total not to exceed 175.00. The eBay dispute process is stacked on the seller's favor and only being diligent and constantly active in pursing your claim will result in a resolution if the seller does not deal with you. In fact, I only know one person who managed to get through the eBay dispute process and get some money. If you paid with Paypal or a credit/debit card there is an easier way. . .
You have to start a claim within a month of payment to get a Paypal refund. Paypal will require you to open a dispute on eBay, but will start working towards a resolution much faster than eBay. I did this a few months ago on an item a seller had grossly misrepresented. Paypal told me to ship the item back registered mail and then input the tracking number into their form. As soon as the box was delivered, Paypal refunded my money. I was actually surprised at how easy this was. eBay was still giving the seller time to respond while Paypal had already refunded my money. If you paid with a credit card though Paypal see the paragraph above. If you used a credit card, you can initiate a chargeback with your bank. Debit cards are easier to reverse than credit cards. Depending on your bank there may be different rules about initiating a chargeback. Most banks say you have 30 days from the statement date the charge appears on to dispute a charge. I have successfully done charge backs 120 days after the charge by being polite and talking to the branch manager. But don't count on getting this extra time. If you have a problem with an eBay purchase paid for with a credit card and the seller refuses to solve the matter contact your bank immediately. Sooner or later you will have problems buying on eBay. The advice on this page will help you resolve the problems. 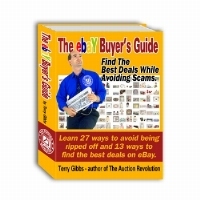 The Free eBay Buyer's Guide has information that will help you avoid problems when buying on eBay. See my buyer's guide to using Paypal on eBay for more information about Paypal.